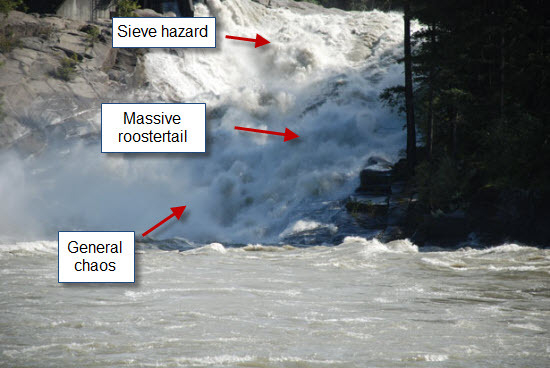 It was October 2008 when everyone’s favorite local paddler, Rob McKibbin, ran the 275-foot Sunset Falls in Index, WA – on his lunch break, for heaven’s sake, after which he geared back up for his contracting job and went back to work. The falls hadn’t been run since 1926, when daredevil Al Faussett drew a huge crowd to watch him run it in a 34-foot canoe. The video of Rob on Sunset Falls was shot by Jake Sanders and is part of the movie Risen Sun, I think, but has only recently been available as its own clip on Vimeo. Here it is. Sunset Falls Rob Mckibbin from Jake Sanders on Vimeo. Rob stuck to his line but his spray skirt blew when he disappeared at the bottom and he was ejected from his boat at the very end. Since then Sunset Falls has been run in 2010 by Tyler Bradt, and again in 2012 by Sam Grafton at around 6500 cfs, and also twice in one day in 2012 by Rob at around 7500 cfs. Rob said I should point out that he got ejected at the bottom and swam both times at 7500, and that Sam “crushed it” at 6500. Which is a typical Rob thing to say. It’s also worth noting that when Rob first ran it he was 43 years old and had only been kayaking for something like ten or eleven years – not a boater since childhood, and not sponsored by any company, unlike so many other extreme paddlers (not that there’s anything wrong with being sponsored, obviously… I’m just saying). Ironically, it was my sister Monique in Germany who emailed me the link to the video of Rob a couple of weeks ago and asked, “Is this the guy?” in relation to an at-the-time upcoming event (see below). 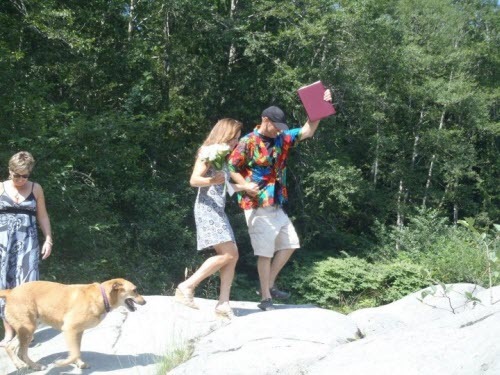 OK, I haven’t asked Rob, but I’m wondering if after running Sunset Falls maybe the second-scariest thing he’s ever done was agree to perform the wedding ceremony between me and Mike Nash last Saturday. :) I only say this because he insisted many times that he would be a complete train wreck, but in true Rob style he totally crushed it, to the point that I told him maybe he had found his second calling. “What’s the line, Rob?” Making sure the bride doesn’t take a header into the Skykomish River on her way to the wedding rock. Photo by Jennifer Jakub. 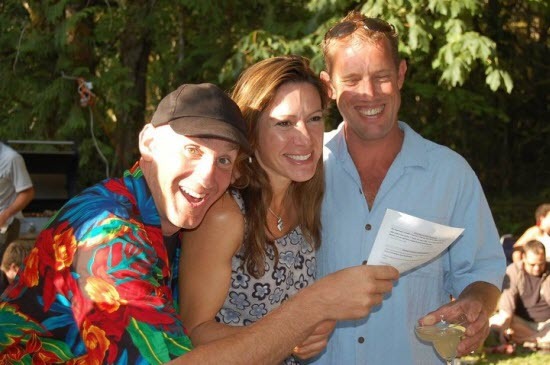 Rob “crushing it” as a marriage officiant. Photo by Dan Patrinellis. Yes, the paper means it’s official. :) Photo by Philippa Swale. 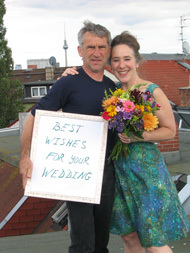 Good wishes from Berlin – thanks Monique and Stefan! Congrats. So between the biggest drop you’ve run and the ceremony, which was the scariest?